Ecology – unlike astronomy, physics, or chemistry – is a science with an associated political and ethical movement: the Green Movement. As a result, the ecological position is often accompanied by appeals to holism, and by a mystical quasi-religious conception of the ecosystem. 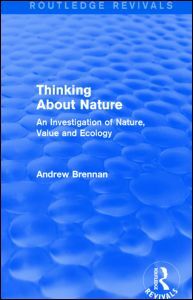 In this title, first published in 1988, Andrew Brennan argues that we can reduce much of the mysticism surrounding ecological discussions by placing them within a larger context, and illustrating that our individual interests are bound with larger, community interests. Using an interdisciplinary approach, which bridges the gap between the sciences, philosophy, and ethics, this is an accessible title, which will be of particular value to students with an interest in the philosophy of environmental science and ethics.